Wireless microphones are essential for many different entertainment technology setups. They allow singers to make the most of their whole stage, unrestricted by cables; they provide emcees and hosts the freedom to work a whole room, without being anchored to a console or podium; and they provide flexibility for corporate presentations, allowing mics to easily pass between a variety of different speakers. A good quality wireless microphone system, therefore, is essential for many varied mobile and permanent audio setups, which was the inspiration for the brand new WU-419V from American Audio. 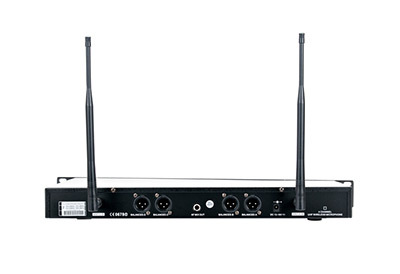 Launched at the recent NAMM trade show in Anaheim, CA, the WU-419V is a 4-channel UHF wireless microphone system that offers an impressive combination of pristine audio quality, reliable radio transmission, and affordable price. It is ideal for use by mobile entertainers and audio production companies, as well as for installation in schools, houses of worship, and conference venues. The system comprises four handheld microphones together with a single, compact receiver unit. The front panel of the WU-419V’s 1U rack mount receiver unit features an on/off switch alongside independent rotary level controls for each of the four mics, together with dedicated audio and wireless signal indicators for each channel. On its rear panel are four XLR output sockets, one for each individual mic, as well as a ¼” jack socket which outputs the combined signal of all four mics. With a rugged metal construction, the receiver is built to withstand the bumps and knocks that are inevitable for equipment used on tours and for temporary events. Despite this robust build quality, the unit is also lightweight and compact, weighing in at 4.25lbs. (1.9kg.) and measuring 19” x 10.4” x 1.9” / 482 x 260 x 49mm (LxWxH). It also features a pair of removable antennas that can be independently angled to achieve the best possible radio signal connection in any particular situation. Each of the four handheld microphones is fitted with a protective metal grill and has a well-balanced design that is suitable for both vocal performance and speech. The mics are each fitted with a combination power and mute switch as well as a battery state indicator LED. The rear section unscrews to reveal the battery compartment and a fully-charged battery will allow for between 6 and 10 hours of continuous operation. 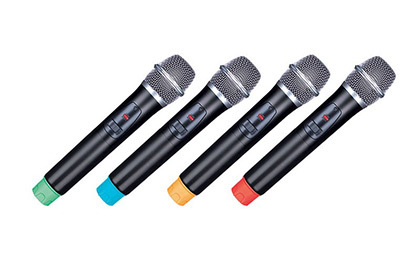 The WU-419V kit also includes a set of colored plastic rings that can be easily fitted to the ends of the microphones. This provides a useful system to allow each individual mic to be instantly identified by an audio engineer when two or more are in use simultaneously, even if performers are moving around on stage or switching between different mics. The system features a quartz-controlled fixed frequency setup that uses the 510-556MHz UHF frequency range. It has a total harmonic distortion of less than 0.5% and a signal to noise ratio greater than 98dB. It offers a wireless range of up to 300ft. (90M) – with line of sight – making it suitable for use in large venues and even on outdoor stages. The WU-419V is a versatile wireless microphone kit that provides four independent good-quality handheld mics at an incredibly affordable price. Retailing at just $349, each mic costs less than $100, which makes this system ideal for applications where the budget is limited. If you’re looking to add wireless technology to your PA system – whether it is used for vocal performances, speech, or both – this is a perfect choice. Equally, if you host karaoke and want to be able to give multiple singers their own mic, while also having one dedicated to yourself, the WU-419V is ideal. The WU-419V is available now from American Audio USA. Currently not available in Europe.